Housing Market Crash 2019 or 2020? Wondering if a housing crash is possible in 2019 or 2020? It’s no easy forecast. Too much is dependent on trade agreements, democrat interference, and the Fed interest rate. It’s a vulnerable time, where markets on edge could actually plummet into recession. Despite positive real estate economics, strong housing market predictions, record job reports and rising wages, ideal homebuyer demographics and good personal debt situation, US mortgage holders still fear a housing crash, yet the housing market is ready to turn around. Americans are well fixed financially, and ready to buy if affordable homes are available. Number one threat now: A trade deal with China is very risky. It might push jobs back out of the US and devastate business investment here. That would crash the housing markets. If President Trump accepts a poor agreement with the Chinese, it could push us into recession, even if multinational corporations breathe their own sigh of relief. What could possibly cause a housing crash and will cause it to grow in 2019? 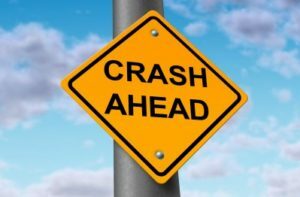 Consider these crash factors below and how they could affect the stock markets. Are the housing markets taken for granted such that big mistakes could result in a plunge? Which are the cities most likely to crash? Which cities should you buy property in 2019? How Vulnerable is Your City? Check the crash likelihood for major housing markets: Los Angeles, Atlanta, New York, Seattle, Chicago, Philadelphia, San Diego, Miami, Boston, Bay Area, Sacramento, Tampa, and Houston. Also, see state forecasts for California housing and Florida housing markets. US GDP is good, real estate economic status are okay, and yet stock market predictions are mixed. At this time of the year is where general trends could be set for all of 2019. Yet, investors and homebuyers should still be concerned about a housing bubble in their cities. Not all states have recovered from the last recession, nor benefited from any Obama era Federal government policies. There really are cities at risk of crashing. The key factors are discussed below. Know them before you buy a home. Will Rising Interest Rates Lead a Downturn? Right now, experts believe that unwarranted rising interest rates along with global trade wars could be enough to send US housing markets crashing. 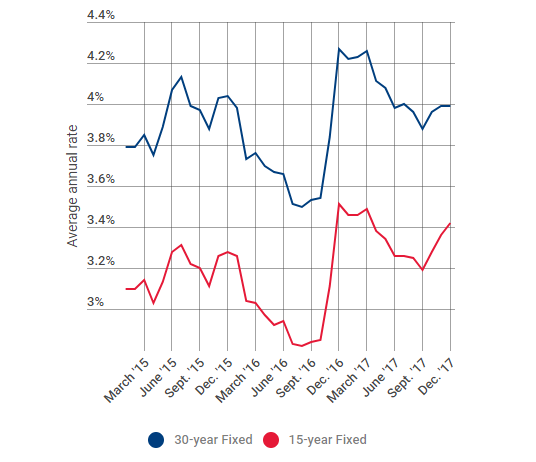 Rates are rising fast (70% higher) and that alone can create inflation and prevent home buying given how high home prices are in places such as New York, California, Texas, and Florida. President Trump is angry about the Fed’s desire to raise rates to cool the economy, which may not actually be that red hot until next spring. Some experts believe the US Fed launches recessions with unreasonable rate increases. In fact, every recession or major catastrophe has been aided by fast rising interest rates. These rate spikes kill off business and put extreme pressures on mortgage holders. Markets crash quickly then interest rates are quickly lowered. The transition to a US centered economy puts the country into a vulnerable period of uncertainty and GDP risk. Companies are hoarding products from China right now while the tariff is 10%, but on January 1st 2019, it will be 25% and that should stop imports completely, especially if the US dollar should weaken. Will companies build factories here or instead hold off and hope for a Trump loss in 2020? Unfortunately, “soft landings” after rate hike cycles are as rare as unicorns and virtually all modern rate hike cycles have resulted in a recession, financial, or banking crisis. There is no reason to believe that this time will be any different — Forbes report. But what happens when Malinvestments in Europe and Asia become visible and crashes begin to happen there? Markets crash when you least expect them to. After reading this post, you’ll see how easy it could happen from California to Texas and New York to Chicago. What will stop the dominoes from falling? “Don’t we learn from history?” Perhaps history can only tell us whether the housing market 2019 is headed for a correction, but can’t really say when or how it will happen, which cities might crash. You’ll read about the likely factors below. 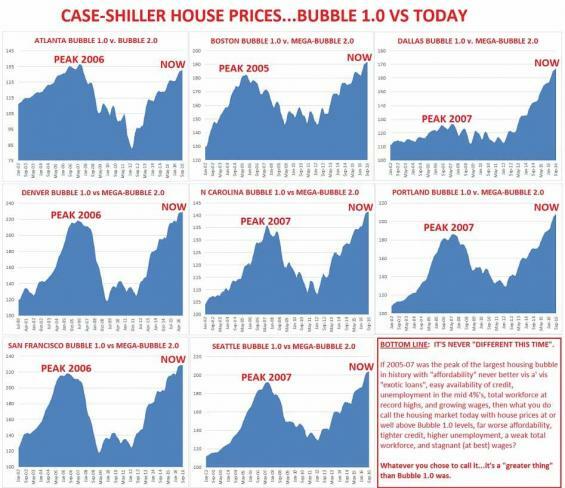 This recent chart from Case Shiller shows the volcano like shape of the last collapse. What’s different about this new rise is the unsteady, less steep climb, upward. Those halting steps could show the fear of investors and homeowners and how panic might be bigger factor this time. Alternatively, it could show housing market resilience. Subprime mortgage default started it last time, but will something else launch the avalanche for the next one? Will a global recessionary tsunami rocket to US shores? 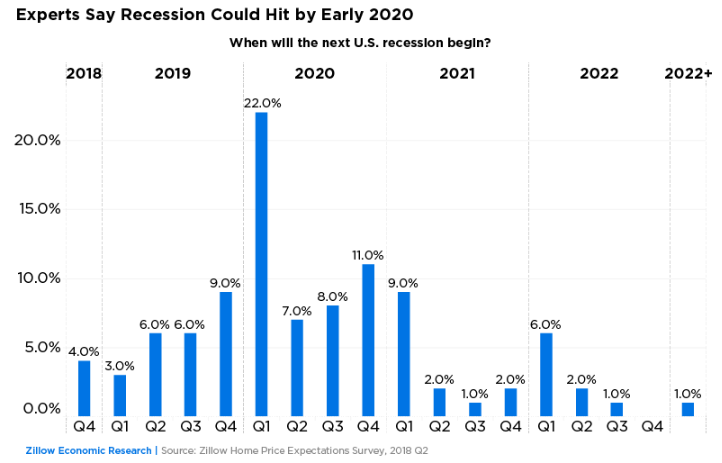 Zillow polled 100 economic experts about the economy and they believe a recession is coming in 2020. Housing crash warnings have been sounding for many years both here and in China, which means the pressure for a big crash has been building. China is in trouble and so is Canada. With pressure, the human element, the human reaction, built on expectations built up by obsessively negative anti-Trump propaganda, could be sufficient to launch a panic-induced collapse. A panic meter might be the most significant crash signal. A small statistical event then might only be needed to spark a crash event (like an ember at a California summer campfire). Please do Bookmark this page and Share on Facebook! What Are the Key Housing Crash Factors to Watch? There are numerous housing crash factors discussed below from geopolitical events to trade related to rising interest rates, the end of stimulus spending, and excessively high home prices. A trade war with China could be crash factor #1. Will debt, deficits, and tariff barriers be the issues that start bursting housing bubbles? Will it be political opposition by the democrats and meddling within the US? See the local metro housing markets: Chicago, San Francisco, Philadelphia, San Diego, Los Angeles, Miami, Houston, Seattle, New York, Sacramento and Boston and for all of Florida. 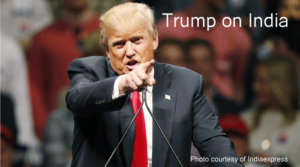 Trump Volatility: America First policies are working for US economic health, but trade wars can fester quickly like a wild fire and cause much pain in the short term. Certainly the recent comments of the President that “Trade Wars are Good” don’t help settle the panic. Trade tariffs, strong inflation and cost of living rises, along with high mortgage rates and the adjustment to new protected market economies are serious threats. Even Trump supporters are worried about the transition ahead to 2020. In this post we try to take an objective look at the unthinkable. At least, it’s unthinkable for some that booming markets in Los Angeles, San Fransisco, Sacramento, San Jose, Seattle, Denver, Las Vegas, Dallas, Charlotte, Boston and Miami could possibly collapse. Others can’t wait for the bubbles to burst so they can finally buy a home. Irrational thinking that can create strange events. Is the Toronto housing bubble (worst in world now) the future for US cities? If the China housing market crashes, will the reverberations hit the US markets? What an interesting but scary phase of US history this is. When Will Local Market Bubbles Burst? If you look at the forecasts for all the bubbled up city markets such as San Francisco, San Jose, Los Angeles, Miami, Houston, Seattle, New York and Boston you’ll likely think back to prices before the last crash. Are you spooked about the real estate market in 2019 or 2020? Leave a comment below and please do share this post on Linkedin. Take a look at the 12 Top Crash Factors listed below to help you decide whether buying a house or rental apartment is still a wise decision. Check the state of the US housing market right now and 2018 forecast. The recent stock market correction gives us pause for thought about how volatility can factor into a housing crash. However, the housing market is healthy with home construction rising and it will be a long time before demand is satisfied. Mathematicians have studied housing bubbles, such as The University of Pennsylvania, and their HOUSING BUBBLE STRUCTURAL MODEL AND HYPOTHESES models couldn’t figure it out. The factors they studied do play a role, but housing bubbles and crashes are likely a cultural phenomenon (outside of major recessions). It comes down to values, attitudes, dreams and panic emotions. There are some financial market players who make their fortune on crashes and if consumers are miffed about the direction of the market, it would be fertile ground for crash talk. As long as Americans are employed with rising wages and growing GDP, housing crashes aren’t likely. Yet, a few experts such as Harry Dent are convinced a housing market disaster looms in the next few years. Even Anthony Robbins is speaking up about it in a video below. A growing number of homeowners and buyers are talking housing bubble. With prices stable, economy strong, and demand persistent, why would so many feel the market could crash? Is buyer and seller pessimism enough to launch a sudden collapse? Have a good look at the current housing market along with the residential markets in cities such as Boston, Houston, Seattle, Sacramento, Chicago, and Los Angeles. If you or your family are considering buying a home or condo, it’s wise to understand the macroecomic as well as human factors (Trump’s saboteur competition). There’s two camps on the 2019 crash issue. First those who see the unbelievable period of economic growth in the US and believe it has to end and who see the end of Free Trade as a forboding sign; and secondly, those who see only positive signals and the solid political footing of the Trump administration in its resolution to bring good paying jobs and industry back to the US. Even if the US is headed for greater things, it doesn’t preclude the possibility of a major market correction in housing. But for housing to crash, a series of factors would have to align. A key factor is a recession. Right now President Trump is heralding an era of trade protectoinism. While this policy can work very well for the US, it sends big economic shocks to formerly dependent economies such as China, Indonesia, Mexico, and even Europe. These countries are full of boastful bravado about their ability to stand on their own two feet without the US. The reality is that the abruptness of this protectionism wave might be too much. If these economies collapse, including a China housing market collapse a Tsunami could be sent toward US shores that would send into recession. Right now, this could be the number one threat. The world’s economies have become tightly woven and a fast release might be too much to handle resulting in a global recession and accompanying housing market crashes. Even though the housing markets have substantial strength, the world is a very connected place. If China and other economies were to collapse, it might be enough to send the stock markets and real estate markets plummeting. Dent says New York, Los Angeles, San Francisco, Chicago and Boston are the riskiest markets. What did say Mellon Bank’s expert say back in 2014, about the source of recessions? Neil Kashkari talks extensively about false prophets (Alan Greenspan) and the sources of market bubbles such as $100 barrel oil, and other uncontrollable situations. He says market bubbles and crashes are very complex and the source is often completely unexpected. Could the oil sheiks take the US economy down again? Could China do it? Is the $20 Trillion debt a threat? Or is just the end of a bull run in the stock market? “However, in those cases where debt is fueling the asset value increase, a correction could trigger financial instability, because banks might take huge losses and potentially fail.” — Neil Kashkari. If you’ve purchased a pricey home or condo, or you’re considering buying a property in the overheated Los Angeles housing market, San Francisco housing market or those in New York, Seattle, San Jose, San Diego, Portland, Austin, Houston, Charlotte, Miami, Dallas, or other hot real estate markets, you’re likely feeling some nerves of late. In San Francisco, the risk of a bubble burst in 2020 is highest and that city is ranked number 1 as highest for a crash. Prices in the San Francisco San Jose Santa Clara Oakland are extremely high and if the tech sector does have an extended downtick with rising mortgage rates, perhaps the forecasted slide could start. Interesting list, dominated by California and Texas, which have been doing well economically. With oil and gas prices predicted to keep rising, I wonder if that will calm the situation in Dallas and Houston? A good number of people are inquiring about a Florida housing crash as well, yet Miami isn’t the whole Florida market. Tyler Durden of zerohedge.com discusses in a post how homeowners are burdened in debt and unable to refinance their mortgages. He points to his key statistic that mortgage owners will not be refinancing their mortgages in 2017 which points in the direction of bubble bursts and crashes. This chart below paints a very scary picture, that it’s worse than 2006. Not only does it correlate 2017 with 2006, it shows that we’re up high on a dangerous cliff in some cities. However, most cities aren’t in this situation, so if a collapse in California, New York and Texas were to occur, other cities might survive okay. There are other mitigating factors too such as the strengths in the economy, foreign investors buying property, and rising optimism and confidence since Donald Trump won the election. At this point, we’re wondering if Obama and Clinton are relieved not to have to face the mess they created? Trump seems to be up to the task and yet, he has purportedly said he would enjoy watching the crash, even if it takes down some of his real estate empire. Is this just a comment on high home prices? The cost and availability of credit provide fuel for a bubble to inflate, inviting even less experienced, or less credit-worthy players into the game, all of whom believe they will sell their recently purchased assets at ever-increasing prices — from a CNBC post. Are you looking for the best cities to invest in real estate or to avoid those metros most likely to crash? The top 80 cities to buy rental properties gives you a peak at the potential of rental property investment. Is this the right year to buy a rental income property? What are the best investments in 2017 and is investing in real estate a wise decision? Disclaimer: this post/information is meant as a discussion of housing and investing issues, ideas and trends, not as advice for investment. Please use good judgement and professional advice if you’re investing in any market whether stocks or real estate. This could have been a useful article, until the author decided to blame and cast scorn upon Obama and Clinton. So unfortunate. How can this report be anything but biased and politically tainted. Thanks for voicing your opinion too Violet. This isn’t Nazi Germany and it’s important that we can all speak freely without feeling threatened. I think my portrayal of Obama and Clinton was generous. I’ve witnessed the downfall of the US in the last 30 years and it’s awful to see. I hope you’ll get a chance to read my other post on the US debt: http://www.gordcollins.com/investment-2/massive-deficit-debt-china/ Do you think Obama generated the results he did get with that $20 trillion debt? If you don’t bring back the good paying jobs and reduce the deficit, how will you pay off that horrible debt? The US needed a strong leader, and although the Tweeting @realDonaldTrump is creating more friction, you have to admire how he’s standing up against the media who have a stake in the status quo. I hope as well that he will level the playing field between multinational corporations and small businesses like yours. My loyalty is with SMBs like your company! Curious to know how you feel about this now that Trump’s hand out to the rich and corporate America is driving the national debt even further up. I agree with the first posting. Interesting synopsis of the real estate market but your support of trump is really misplaced. He is a liar and cannot be trusted in ANYTHING he does. The 90s under Clinton and the GOP congress was the best economic expansion in our country’s history, period. Opportunity everywhere. Taxes were high, but we were more balanced. The Obama years were more about the Tea Party than anything. And guess what. Unless Trump solves this dilemma, he’s done and we’re done too. The FED is the only thing that has kept us from roiling over the edge for the last 8+ years. And I’m guessing under Trump after a few years of super heating the economy again, like under Way, we’ll be looking at another speculative crash. Why? Because the GOP has sold us down the river. NO? Everything in our lives now reflects business and speculative interests? Who benefits? Gee I don’t know. Maybe rich people that can speculate on everything that touches us. Time to leave. You stay in the game and keep preaching growth instead of stability. Let’s see how it all works out. Very interesting comment Mark. Thanks for the insight. I do have doubts about President Trump. He’s never stated that he cares about small business. He didn’t state that when he talks about jobs leaving the US, he’s really talking about decisions by greedy multi-national corporate execs and how they stick it to the government. Your admiration of the Clintons I don’t know about. They’ve all been riding the national debt gravy train at ($20 Trillion now). But really, can you just keep living off of credit cards forever? Trump’s trying to turn things around. Even if morally, he’s at the same level as Bill Clinton, we can give him a try at bringing the good jobs back. You do realize China and India are educating and churning out high tech engineers by the boatload, using your money? Are US companies basically competing with overseas companies funded with American money? That’s not FREE TRADE, that’s tax evasion and outsourcing for cheap labor. Trump’s foolish obsession with Mexico and North Korea, might be a sign his mind isn’t 100%, but without Trump, you’re back on the debt gravy train. Clinton left office with a budget surplus which means we were paying off the debt. Bush came in and ballooned the deficit with an unfunded war and loosened regulations which caused the housing bubble. Bush came into office just as the terrorists mounted their attack. Clinton was the President previously. I think Bush was stunned at the attack just as he was sitting down in the Oval Office. Are you suggesting they attacked because of what they thought Bush might do in future? Half of the debt came with Obama so why is he innocent of all this? Why couldn’t the trillions dished out be tracked? Wouldn’t it have been better spent on badly needed infrastructure spending? Joe, I’m not sure you have a good argument here, but thanks for contributing. If we, in short order, enter into a recession it will be directly related to the bail outs and QE put in place under Obama’s watch. They did what they thought was best, but much of the benefit of all this asset inflation has not gone to the average person and it has put us in uncharted territory as we begin to embark on an unwinding journey in the Fall. I don’t personally see how Clinton(Assuming we are talking about the president here) factors in. He presided over the only surplus we have seen in my short life. In fairness it didn’t seem he had to do that much to achieve that. Just ride out a tech economic boom and he didn’t cut taxes. Hillary is not and has not been relevant to our economy. I am not an expert on what a president should do and most can be picked apart pretty readily by experts. But it would seem that the current trajectory of the Republicans under Trump is not one of reducing our deficit. Yes they want to scale back a great deal of spending. The problem is they want to dump a lot of that savings back into a bloated military budget and on top of that are considering drastic tax cuts. No analysis thus far has been at all optimistic about any potential increase in growth outrunning the addition this will make to our debt over the long term. So if that number is a concern neither party has shown a willingness to fix it. Hell Trump wants an infrastructure plan and a wall, that I guarantee you no tea party politician will want to pay for. Trumps only thought to reducing our debt is that he can manufacture a economic boom to outpace spending and cuts. I’ll believe it when I see it, but on paper he wants to be a bigger spender than an average Republican. Our deficit and debt as numbers alone are kind of meaningless.. It only matters relative to other countries and relative to our GDP. For better or worse current economic theory under globalization seems to expect every country to grow and amass more debt while keeping those two values in some kind of balance. So it is hard even for an economist to say how relevant the size of the number is. And a lot of that theory is working out rather poorly for many Euro countries right now. What I see today as concerning has very little to do with Presidents and everything to do with global banking and Fed policy. We have put our selves in a precarious situation with QE in order to massively re-inflate stock values and home values and it has worked beautifully as we have allowed that easing to go undiminished for over 8 years since the meltdown. Now we have to see what happens as we finally attempt to reverse course. My hope and my fear is that we will come back to reality in the form of a recession, almost certainly in the next 4 years. Interesting points. To say a 2 billion dollar a day trade deficit is meaningless might be understating it. Running trade deficits every year is dangerous and leads to the recession you’re fearing. It’s the trade policies that make it happen. The global economy was highly dependent on US willing to run huge trade deficits and Europe and China are undergoing withdrawal problems. I think the US has a super position if Trump can get past all his enemies and stimulate the GDP and domestic productivity. It’s not easy to bring good jobs back. He’s really bit off more than he can chew. If he can cut small business taxes, that would launch the country into boom times. If he doesn’t do something soon, because things are quiet right now, even his biggest supporters could possibly turn on him. Housing prices are overinflated and the “growth” is unsustainable. I am hoping that it all crashes down again because I want to buy a home and I am not interested in buying at the insane prices that are around right now. Lana, a lot of people are talking housing crash in many markets, but that could take the whole economy down. Even with a crash, it would still be tough for buyers. The right approach to bring prices down is more housing supply. The governments should provide tax breaks and other incentives for housing development and legislation which promotes new housing projects. Good finding a place you can afford. In Southern California, the pacific rim money has driven the market to a dark place. Dark in the sense that to afford an “average” home you need a household income of $170k annually and that has increased the number of people living in newly purchased homes. Chinese millionaires are dominating the market and the middle class citizens are living paycheck to paycheck or leaving California for better quality of life. I also am rooting for a reset. Been here 43 years and would like my children to be able to live here someday as well. The US should heavily tax the foreign investors but they do not as the legislators love all the extra property tax revenue. Marc, I hope you and your kids can stay in So Cal, but can you see how the money and people are being vilified for wanting to be part of California’s successful economy and lifestyle. The real villains are those who are preventing development. And that new development really drives the economy, thus giving California a chance to compete in the global age. Other cities in Canada and the UK have the same problem and in each case it’s politicians squeezing supply. And the actions they’re taking does point to a recession eventually. If California’s polticians remove constraints, you’ll have lower prices in San Diego, LA and the SF Bay Area. The market alway solves itself. I’m right there with you; I work in production and have seen MANY empty luxury condos and homes owned by the Chinese. They buy up properties and leave them empty as they accrue wealth. As for those of us who live/work in LA? We don’t matter unless we can easily come up with $100K + for a downpayment on more luxury condos. We’ve been waiting for this crap to “trickle down” for years. All I’m seeing are homeless families that used to live in apartments that have been “flipped” by corporations like Blackstone – who also don’t reside in CA. Hello! Politics aside, this gentleman seems to think that we don’t need any more inventory. He seems to think that we are on track and doesn’t predict a crash at all. Which saddens me a bit because homes in Portland are ridiculously overpriced and unaffordable for a single income family. Please let me know your thoughts on his analysis. Thanks! Yes, he’s applying national stats only to local markets. It’s difficult to deny the severe housing shortage in most markets inlcuding Los Angeles, New York, San Jose, San Francisco, Dallas, Seattle, detc. He takes aim at Millennials, whose dreams he doesn’t regard as worthy. There are a lot of people who would like to stifle new housing growth as a way to increse the value of their own property investments. As long as they control politics, housing shortages will continue. You’ll blame Clinton, who left office in a surplus, but not once mention Bush, who nuked the American economy in so many different ways we’re still struggling to recover? Sorry, I can’t reconcile one accepting such a ludicrous proposition and also being a sound source of analysis. Did you ever stop to think about how goods and services can’t teleport? We don’t have teleportation technology – or magic, for that matter. So when a president/congress decides to move the economy, it takes *time* for the economy to react. Policies take time to come in force, markets take time to guage impacts and respond accordingly, equilibrium is established only after a long series of interractions. It takes *years* not days or weeks. You don’t judge a president (or congress) by what happens immediately after they take office (read: the economic meltdown during Obama’s first term, or the economic uptick during Trump’s first few months). You look at what happens two years into their term of office, with acknowledgement of the context. You know what would be a great follow up article? Where to go with your money when the market pops. US dollars did well right after the 2008 collapse, are the conditions similar now as they were then to allow for a similar strategy? If not, then where? The cost of ownership in the most high priced markets is going up even more. Why? The limitation on the mortgage interest deduction to $750K and the limitation on the sales and property tax deduction to $10K. With the increase in interest rates, the partial non deductibility of interest and taxes, the overall cost of ownership is going up. Most people will feel the punch in their guts next year when they file the 2018 taxes. That is when most folks would realize what hit them was not a pleasant surprise! The markets, if it still has any sane players left, will then correct drastically. I’m in the market to buy a house in San Diego County and turn it into a vacation rental. I own one and it is very successful. I’m wondering if I should wait to buy, and if a recession would lead to a decrease in vacation rental bookings? I’m concerned and do not want to find myself under water. Any updates on this fascinating chain of discussion as of April, 2018? Hi Tamara, a vacation rental property owner in San Diego County I knew did well during the recession. Prices are much higher now and you’ll need to be a very good rental property manager. Take a look at the San Diego Housing market report if you didn’t read it. San Diego’s fantastic and the shortage there will never ease. 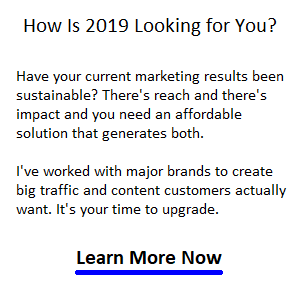 My opinion is that you need to be a good marketer to keep it rented. If you build up a good database of returning renters, you should be okay. With VRBO and Airbnb, you’ll have extra reach too. With Trump bringing jobs and investment money back home, I can’t see a recession, just volatility and maybe some trade wars! Hey, thanks so much for the reply, Gord. I appreciate it. Yes, I’ve built one property and it’s a top vacation rental in its area. I’ll just have to be smart with the next one, and with looming fears of a recession (whether or not it happens) and stock market volitility, sellers appear to be spooked and dropped the price, so I’ll be able to buy the property for less. Timing might be good. This has been a fascinating post and comment chain. Thanks again. Thank you Gord for your reply. It is really disappointing. I scare we have to rent and save more money for down payment and by that time the prices will go higher. It is really hard. We wanted sth in La Mesa. Hello Gord, any idea about the DC market and Northern Virginia? The average price of a 2100 sq foot townhouse is now $675K and over inflated. I want to buy because I have a toddler and we need more space but don’t want to be under water if the market crashes. Hi Skylar, I can’t offer advice unfortunately. Availability in Northern Virginia is very constrained, so the question is whether new homes are being built. 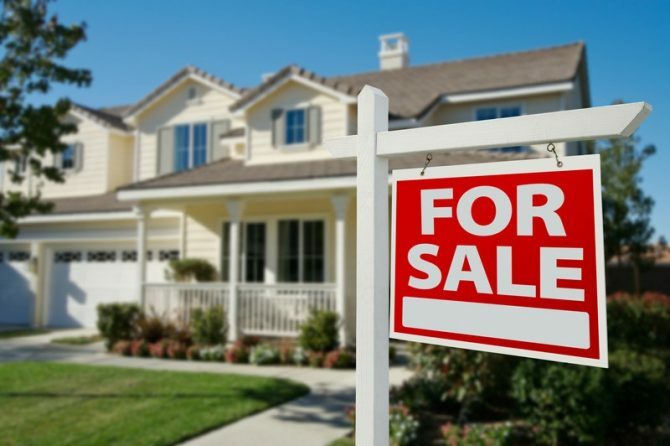 People aren’t selling their homes, listings down 4%, and the economy is strong. It’s risky which is why governments are amending financing rules. Did you consider buying a property with a rental income unit? Gord, been considering buying in North County San Diego for the last couple years but really fear these out of control prices could come back to bite this first time buyer. Do you think its a good time to buy or wait another year or so? Hi Jack, I can’t offer advice and I can’t imagine a first time buyer buying in North County. Oceanside home prices are up 11% in the last year, so a lot of buyers/investors are optimistic. I don’t see availability improving much in San Diego County and with the economy so strong, things look good. However, with geo political uncertainty, you need to be able survive a crash anytime in the next 5 years! Gord, Thanks for the input and great information! You think prices will continue to rise in San Diego County? I’ve had many long time real estate people tell me a correction is coming because the market is so hot. Any truth to that? 3)Interest Rate Hikes >5 on Trump in a year and a half. Thank you, Gord, for the insightful article. We bought our SoCal (South Bay) home two years ago and our neighborhood’s prices have soared since. We are currently looking at a potential profit of more than $350k given recent comps.. Definitely not a bad thing, but it’s creating a dilemma in our home since my husband is all about cashing out while the market is hot and renting until prices go down again. I on the other hand, am more in favor of doubling down on our home and area by converting our garage to a liveable (and rentable) unit. We really like our area and home, but the potential profit is incredibly enticing. What do you think would be the smartest move in this circumstance? Thank you Andrea, you’re welcome! Amazing, and a beautfiul area to live. I’d like to drill down into all the LA communities. Incredible that your home appreciated that much over 2 years. Could you get a quote on the rental income upgrade and compare ROI? Are there local restrictions? I think selling is the right move for most, even if you don’t have an idea of where to move to right now. I guess it depends on your financial status and whether you need your jobs and whether you can take a sabbatical. If you hold on for the time it takes to the convert the garage, you could earn another 100k? The demand for rentals is expected to persist. A lot of buyers will like that separate living space even if they don’t rent it out. Are the rentals you could live with reasonably priced in your area of South Bay or will you have to do the long commute? can you comment on the Seattle market? I’m looking to buy my first home in northern CA but I’m going back and forth with whether I should hold off. Prices are incredibly high here. I keep thinking prices will decrease (been saying that since 2015) but that’s not happening. Enjoyed reading the article. Hi Carol. What a nice problem to have. Don’t know much about your neighborhood but how much would the upside be if you waited for another year? Isn’t it more costly to hang on and pay the property taxes? Do you have a Realtor actively marketing it to investors? So would it be wise or not to purchase a home in Los Angeles, CA between this year and 2019? If we do purchase, theres a possibility of a housing crash? I think it would depend on your financial situation and what you’re buying. I can’t advise you however if you’re debt to income ratio is realy high and you’re in deep with a big mortgage, you’re gambling. We bought our dream house in 2008 and lived there for 10 years. We enjoyed our new house and made money in the process. When the things were bad, we got a roommate who helped paying for the mortgage. My advise is that buy a good area and live there for at least 8 to 10 years. Nice analysis Gordon but home prices are still going way up and 2018 is over half over. When will the crash occur? I see foreigners like China buying up real estate like crazy! Thanks Ben. If I knew I’d be rich! Yes, everyone’s looking ahead to 2019 and I’m developing a post on the topic right now. We likely won’t see a crash anytime soon, unless the G7 get carried away by all the tariff talk. Which could happen. The rest of the world has become addicted to US spending, although they describe that as “beneficial interdependent trade.” They’re actually getting surly about it, (G7 meeting) so we can’t say this won’t escalate into something bad. It looks like they’re going to threaten Trump with Tariffs and numbers and see if he bites. He hasn’t even dealt with China yet, so this does look scary. As you said, prices are rising and the demand is there. As long as Millennials are able to buy, this boom could go on a long time. However, how many of the G7 would enjoy seeing the US economy plummet? My wife an I are looking to buy our first home and to know surprise, yes we are millennials. We live in Omaha, NE. According to CNBC it is one of the top 5 most difficult cities for millennials to buy their first home thanks to very low supply and high prices. Should we opt to continue to rent a 1 bedroom apt for $800 per month while waiting out this craziness. Or should we buy a home now to get locked in a historically low interest rate? We are torn, because we want to get into a home, but are patient and disciplined enough to wait if that’s the best financial decision. Do you see this overvalued market correcting anytime soon? Any help or insight would be greatly appreciated. Hi Aaron, so nice to hear from someone from Nebraska. I see how prices are rising fast again this summer. I’m wondering that with few listings, what kind of home would you get if you bought this year? Could you find a real gem? The US economy will grow so prices in Omaha are likely to rise strongly. Soybean prices are way down, there’s a lot of risk for 2018/2019? I suspect rent until you’re sure is the best advice. Good luck with your decision! Enjoyed reading the article. What do you think about the Atlanta market? Since the last crash, the housing market has skyrocketed with new folks/millennials moving into the area. I can’t imagine how people are able to continue to afford these rising prices. The pay out is not matching this rising cost of living. Any words or advice for the Atlanta market? Hi Kristen, glad you liked it. There’s more chatter about the Atlanta region so I think my next post should explore your market. With the economy booming, Atlanta could finally get red hot. I’ll look into it! I think we are missing the whole point here. California home prices are declining due to too many liberal policies and high taxes. People are leaving there in droves. 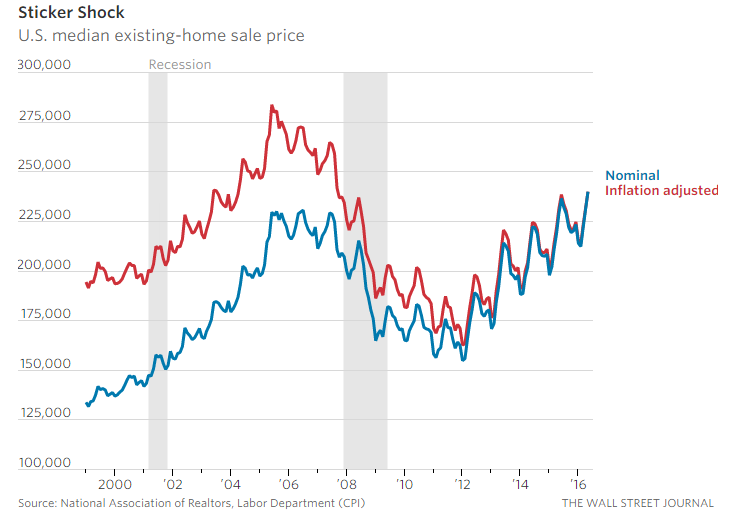 Almost anywhere else prices are soaring. You stated a few things that can cause a housing crash, High taxes and high utilities. The democrats of CA just passed three bills.. First bill was to increase our gas and registration tax. Second. bill PG&E was given the ok to charge its customers more to pay off their lawsuits from the 2018 fires it has caused, and third which is the grand finale is putting a fine, or I say another tax, on residential home water usage. the current bill brown is expected to sign will limit 55 gallons of water per person per day by 2030 then it will decrease to 50 gallons per person per day. as you know it takes roughly 17 gallons of water to take a 8 min shower. 80-100 gallons to take a bath, 4 gallons to flush the toilet, etc… so 55 or even 50 gallons of water daily is an impossible task and the democrats know it and using the water skirts to tax us yet again by fining us if we overuse our water usage.. this strategy is smart and sneaky. they are taxing on things we have no choice but to pay and cannot fight against. so that being said will this cause CA to go down the dumps along with housing prices?? I have already witness many middle to higher class citizens leave in large amounts in the last 3 years. and in the last 8 years a huge increase in homeless rate.. I am also concerned with the decision of the 9th circuit court that they have a constitutional right to sleep on sidewalks and parks which will further bring the state down. Another thing to ponder is, the northern fires which destroyed many fine wineries and agricultures will decide to not rebuild and they will also flee CA causing a good size dent in our economy. Deanna, yes I did read and write about it actually. It’s horrible for Californians. Brown’s lack of hope, imagination, and entrepreneurialism reflects what’s happened in the US in the last 30 years. If it doesn’t benefit the multinationals, you’ll see neglect, and “water opportunity” is just scorned. Whoever solves California’s water problem will be a Trillionaire many times over! There are some people on this comment section who are so suffering from Trump Derangement Syndrome that they fail to see that Trump is the best thing our economy has seen since Ronald Reagan. Trump has been responsible for putting trillions of dollars to work in all of the important markets, such as the stock market and real estate. Economic growth has never been so high in the last twenty years, and unemployment is at record low levels. If certain commentators can get over TDS, perhaps they can see that the problems will occur if Democrats get elected. All the dems promise is higher taxes and more regulation, which means lower economic growth and lower values. However, it is not clear that even Trump can overcome rising interest rates. Over the years we have found that you cannot fight with the Fed. The fed can dominate other economic forces. Hi Gordon, great article. Like others I have the money to purchase a home now but I’m wondering if I’d be better off waiting till 2020 to do so given the potential volatility and uncertainty ahead in the next year or two. My current market is the Salt Lake City Utah area, would love to hear your thoughts! Hi Gord, I really liked your article. I am happy to see Salt Lake City as one of the top ten cities likely to get experience a crash. My wife and I are saving up cash for our first home. We are both 33 and have one daughter. We can’t believe how ridiculous the asking prices are for the crumbling shed 1950’s homes are here in SLC. The contractors out here only build huge $300k+ homes or high density housing which is nothing we want. The wages here have not kept up with the increase in home prices. Any idea when Utah might see a price crash? We can hardly wait! ← Previous Post: Are We Headed into a Recession?